The Great American Eclipse is upon us! 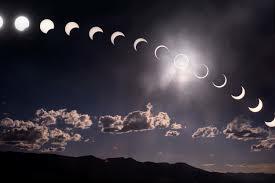 A solar eclipse is among the most dynamic and fascinating natural phenomena we experience in our environment. It is a scene of unimaginable beauty—the moon completely blocks the sun, daytime becomes a deep twilight, and the sun’s corona shimmers in the darkened sky. This year, we will experience an extraordinary total solar eclipse. This event is significant because it will be visible only in the continental U.S.—hence the nickname The Great American Eclipse. And luckily for us, Idaho will be prime viewing territory. You will need eye protection to view the event safely. Join us at our Eclipse 101 presentation with Matt Benjamin, astronomer from Boulder, Colo., who spent the last decade managing Fiske Planetarium at the University of Colorado. Matt was an invited speaker and teacher for NASA’s “Journey Through The Universe” program. He has also been visiting Ketchum for 35 years with his family and considers Central Idaho a home away from home. At our Eclipse 101 presentation we will take a close look at eclipses, how they work, the marks they leave on history, and safety issues. We will also talk about how you can be best prepared to see this once-in-a-generation event. We hope you join us for our Eclipse 101!